George Graham Reviews Kelly Joe Phelps' "Sky Like a Broken Clock"
The healthy interest in the blues in recent years has allowed for the cultivation of performers who base their music on the blues but often go in innovative directions. Likewise, the current period has also seen a revival in acoustic blues. Kelly Joe Phelps is a distinctive performer who represents both aspects -- an acoustic musician who brings remarkable virtuosity to slide guitar, and an artist whose own original songs go well beyond the musical territory of the standard blues form, and often conjure up traditional-style folk, which Phelps has also included on each of his albums. The Pacific Northwest-based artist has released his fourth CD called Sky Like a Broken Clock, and while Phelps distinctive musical amalgam remains at its base, this CD represents a significant departure from his previous work. Perhaps the most salient change is that this recording features a band accompanying Phelps, whose previous albums had all been solo. Also notable is that he dispenses with his slide guitar style and concentrates on a more folky finger-picking guitar approach, and as another change, this CD consists of all original material, rather than including the traditional songs that have marked each of his albums up to this point. Kelly Joe Phelps' musical journey is an interesting one. The son of musical parents, the young Phelps took up piano at age eight, and later learned guitar, drums and bass. In his early teens he was attracted to the more experimental jazz of John Coltrane, Ornette Coleman and Miles Davis. But around age 17, he was taken by the blues of traditional Delta bluesmen like Mississippi Fred McDowell, Skip James and others whose instruments were acoustic. He has been playing acoustic blues since, honing his skills to the point that he has attracted many well-known musicians as his fans, including Steve Earle and U2's The Edge. His three previous CDs were notable for their pure, live approach with no overdubbing, and a solo setting, which made his music all the more powerful, combining his jaw-dropping guitar work with a vocal approach that can be at once doleful and slightly detached, yet very warm. Phelps felt that we was ready to try something new, so his record company's president, flexing his record producing skills, got Phelps into the studio with a trio consisting of acoustic bassist Larry Taylor, of Tom Waits' band, and drummer Billy Conway, of the group Morphine. There are some other added players on cello and organ, but much of the record consists of the trio. The result is not what I would call exactly a blues album -- it's the work of a distinctive singer-songwriter whose music is quite difficult to categorize, and whose lyrics can be poetic to the point of inscrutability. Perhaps it was presence of Larry Taylor, or maybe it was because Phelps' music was headed in this direction anyway, but one can draw a lot of parallels to the songs of Tom Waits on this CD. Although Sky Like a Broken Clock has a lot going for it, I must say that I miss Phelps' slide guitar work, though on the other hand, hearing his songs with a sensitive rhythm section backing him given them a new dimension. Producer George Howard points out in the liner notes that the CD was recorded within a week, with everyone together in the same room. Prior to the sessions, the musicians had not worked with each other. Rehearsal was fairly minimal and most of the recordings are first or second takes. There was no going back and fixing someone's part -- either the entire performance of a song was used as is, or the whole song was re-done. One can hear little imperfections here and there, but it does give the album the kind of musical honesty that marked Phelps' previous work. 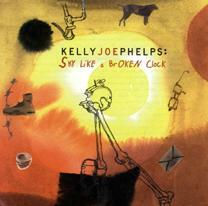 Kelly Joe Phelps' new fourth CD Sky Like a Broken Clock, is a departure from the solo acoustic sound of Phelps previous, widely acclaimed albums. He goes from solo acoustic folk bluesman who often interprets traditional material, to the cryptic singer-songwriter on this collection, accompanied a tasteful backing band, and marked with lyrics that sometimes resemble the kind verbal conundrums that harken back to the 1960s and the days of altered consciousness. The performance by Phelps and his band are first-rate, and the fact that each song was recorded essentially live in the studio gives it a degree of honesty that is rare these days. Sonically, though, the album is rather a disappointment. In his liner notes, producer George Howard speaks of very expensive microphones used in the session, but the recording lacks clarity, immediacy and depth. Lately, in some circles there is a backlash against digital recording. This was obviously an analogue recording with tape hiss and tape saturation that especially muddies the acoustic bass. And Phelps' vocal seems a bit distant. It is a decided step down from the sonic quality of his previous albums. We'll charitably give it about a B-minus. Kelly Joe Phelps remains one of the most distinctive figures on the acoustic blues scene, even though this is not a very bluesy album. Though I miss his slide guitar playing, and the album's sound quality could be better, Sky Like a Broken Clock is a worthwhile and intriguing album that can reveal something new at each listen.